The amazing Empires documentary continues with this current instalment focusing on the Medici family who would eventually rise to power in Europe and ignite one of the most influential, cultural and artistic revolutions of the era, the European Renaissance. Collecting all four episodes from this current series, the documentary uses dramatisation and experts information to assist in informing the viewer of this powerful and influential family from a small Italian village. Interesting enough, this family spent three centuries in power who began as humble merchants which eventually lead them to becoming "royalty". The dramatisations are brilliant from the impressive acting skills of those involved to the wonderful period costumes and cinematography which nicely comes together. The series focuses on key individuals within this family and their enemies such as Machiavelli and Savonarola that even though some called them dictators and power hungry merchants, they inspired an entire continent through their influence. Some say that this was the next stage of enlightenment for mankind with Lorenzo the Magnificent. 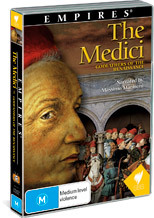 Beautifully narrated, Empires - The Medici: Godfathers of the Renaissance is a must have documentary for anyone interested in this period of history or the documentary genre, very well made and recommended. After centuries of ignorance, one city at the heart of Europe is poised on the threshold of an intellectual and artistic revolution. And one family surpasses all others in defining and shaping it – the Medici. Cosimo de’Medici and his sons oversee the first flowering of the renaissance, from Brunelleschi’s Duomo to Donatello’s sensuous David. But with Cosimo’s death comes uncertainty and the future of the family rests on the shoulders of his young grandson, Lorenzo. Lorenzo de’Medici oversees the full flowering of the Renaissance, the greatest culture and artistic movement the world has ever seen. Michelangelo, Botticelli, Leonardo de Vinci and others create some of the greatest works of artistic genius the world has ever witnessed. But a zealous young monk – Savonarola, whips up a violent fundamentalist backlash. As the family are chased out of town, Botticelli hurls his own masterpieces into the flames. How will the Medici, and the Renaissance, recover? Having been forced to relocate to Rome, the Medici turn their sights on the Catholic Church. Giovanni is crowned the first Medici Pope, only to encounter the greatest crisis to ever face Catholicism – the Protestant Reformation. Standing against the monolithic power of the Church is a single monk – Martin Luther. Luther unleashes wide disorder by redefining man’s relationship with God and attempting to overthrow the oppressive tyranny of the Catholic Church. Can the Medici control the very revolution they themselves have inspired? Now the staunchest supporters of the Catholic Counter Reformation, the Medici struggle to restore order to a world spinning out of control. Scientific enlightenment collides with strict Catholic doctrine and the Medici face a stark choice – to continue to patronise scientists like Galileo or to retreat to established Catholic authority. Forced to choose, the Medici betray the intellectual ideals that they have fostered for generations. Nevertheless, the Medici left an extraordinary legacy in their wake.